For many goods purchased in Thailand, Value Added Tax (VAT) at 7% is included in the price. 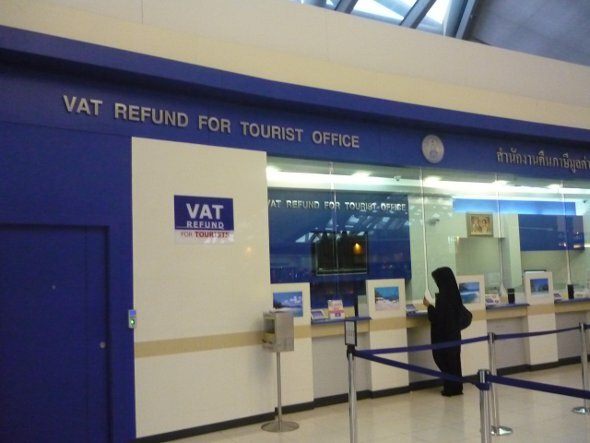 The good news for tourists is that in many instances it is possible to claim back the VAT before you depart Thailand. To be eligible for a tax refund, the goods must be purchased at a store that participates in the VAT refund for tourists scheme. This includes most major department stores like Central World and brand shops such as Apple. When you buy your goods confirm that you would like to claim the tax back and the staff at the shop should give you a tax refund form (known as a PP10) and a tax invoice. You will also need to show your passport together with the immigration card that was attached to your passport on your arrival in Thailand. The PP10 will partly be completed by the store and partly by you. VAT can only be claimed back if you are departing Thailand from certain international airports (e.g. Bangkok, Chiang Mai, Hat Yai, Ko Samui, Krabi, Phuket and U-Tapao). At the airport, present your PP10 form and tax invoice at the designated customs inspection office before you check in for your flight. You may also be asked to show the goods and your passport. The customs officer will then stamp your form. You can then check in for your flight and proceed through passport control. The second office where your refund will be made is in the departure area after you have proceeded through the security and passport control/immigration counters. Luxury goods such as jewellery, gold ornaments, watches, iPads etc. 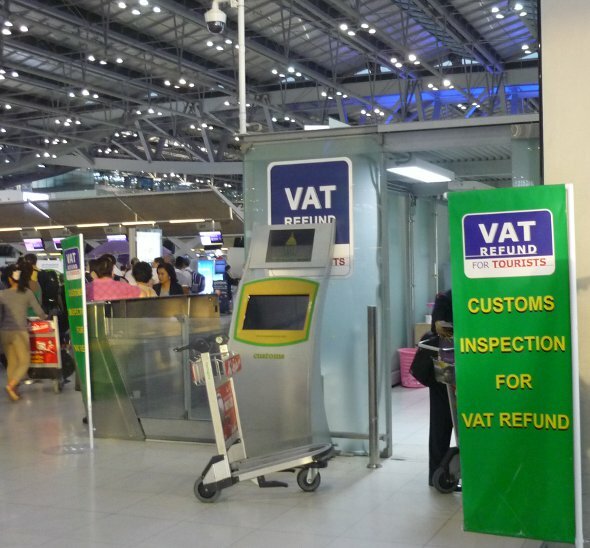 where the value is more than 10,000 Baht must be carried in your hand baggage because they may need to be re-inspected at the VAT refund office. This office is located after you have cleared passport control and security. For tax refunds of under 30,000 Baht, payment can be made to you in Thai Baht, bankers draft or to your credit card account. For cash payments, a 100 Baht processing fee will be deducted from the money refunded to you. If you are claiming back an amount in excess of 30,000 Baht, payment will be made by bank draft or credit card account. For refunds made by bank draft, the fee is 100 Baht plus the appropriate fees charged by the issuing bank. You have the option of presenting your claim in person or mailing the form to the Revenue Department of Thailand (RDT). See the RDT website for full details. The minimum amount of your purchase is 2,000 Baht. Goods need to be taken out of Thailand within 60 days of purchase. Thai citizens or those permanently residing in Thailand are not eligible to claim VAT refunds. You must present the original tax invoice to claim a VAT refund. It’s a good idea to keep a copy of this because the original will be retained by the officials who process your refund and they will not give you a photo-copy.